This exquisite engagement ring features a beautifully-milgrained diamond studded shank, gallery and halo, which surrounds a brilliant 7.5mm center stone, not included, in this exquisite engagement ring semi-mount. The ring features 172 natural diamond accents weighing .50 cttw. The shank tapers towards a beautifully designed basket gallery and 10mm diameter halo. This engagement ring is priced as a semi-mount only. It does not include a center stone. Call us today for a quote on mounting your favorite stone in this ring. 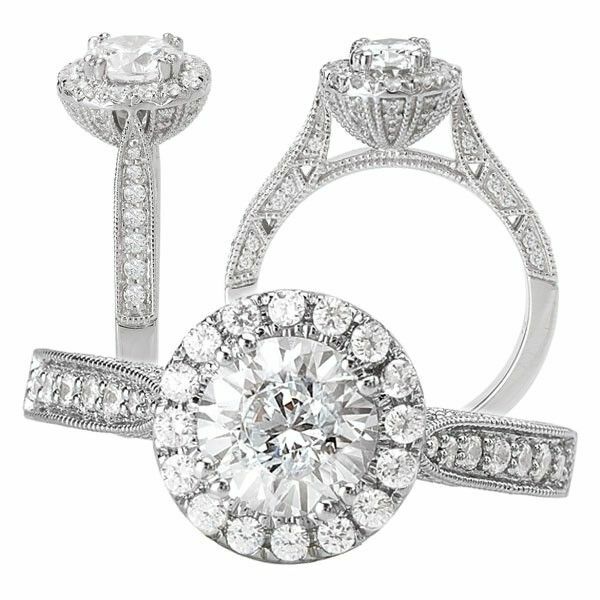 This engagement ring matches wedding band KI-117364-W, sold separately. Every maker has a story. Be a part of Michelle M Rahm: OurCustomWeddingRings's story by placing an order, leaving a review, and seeing your review appear here.